- Additional Soda Refill stations. It's unclear if the mobile ordering will be just for CFG, or if it'll be available elsewhere. In any case, this is a step in the right direction. I make it a point to recommend mobile ordering whenever I do a survey. On some days, the line for food can be longer than for a ride. One less line to stand in makes me happy. P.S. The additional soda refill stations are nice, too. Mobile ordering was briefly mentioned on the last earnings call. I wouldn’t be surprised if it was at most restaurants across all parks. Does anyone know where they'd put the new restaurant in Hurricane Harbor? SFGAM_Hog wrote: Does anyone know where they'd put the new restaurant in Hurricane Harbor? To the right of the Pink Flamingo Cafe, there's a building "wing" similar to the one to the left (Paradise Pizza). Right now, that section is built out with a couple of refill stations. This is the only vacant spot I can think of that could house a new dining location in Hurricane Harbor. 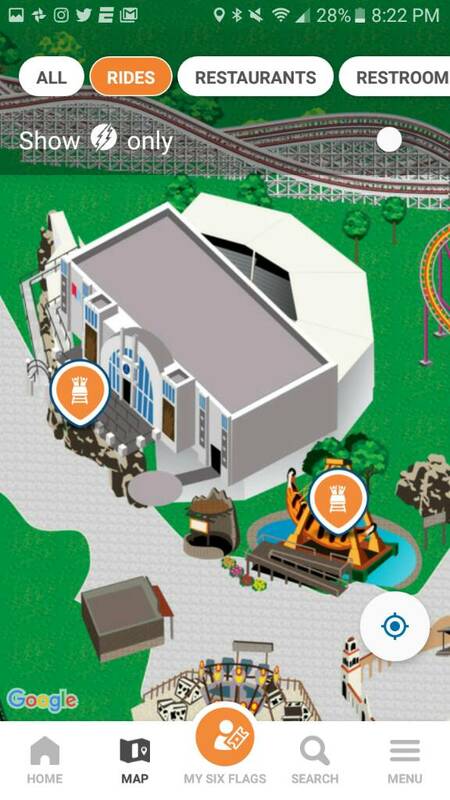 They did confirm at No Coaster Con that it would go to the right of Pink Flamingo. Somewhere next to it at least. Has anyone tried the new survey that came out for mobile order? It gives you a nice preview of what it's supposed to look like. I like it so far. rmceagle2021 wrote: Has anyone tried the new survey that came out for mobile order? Took it the other day when I got the email. Don't necessarily like the idea don't start cooking you meal till you arrive. Potentially if there is a big regular food line of people ordered but waiting, you could get still get stuck in a good wait. It's Six Flags. There's no way there's not going to be huge waits no matter what they do. Most of the food isn't cooked to order anyway, so in most cases, they'd just be assembling your order once you got there. The iPhone app has a mobile food ordering button now. Clicking it says coming in 2019. One thing I've realized is that they have MANY foreign exchange students working at the park, seemingly most of them are in the foodservice areas. I think to speed up operations, they should have people that speak English well be the ones interacting with the customers. I've been thinking that for a while now. It definitely slows down operations. Is online ordering up and running yet? Has anyone tried it this opening weekend? UnclePennybags wrote: Is online ordering up and running yet? Has anyone tried it this opening weekend? I could be wrong, but I believe it's launching some time in May. I think they said park-wide WiFi in May, mobile ordering in June.